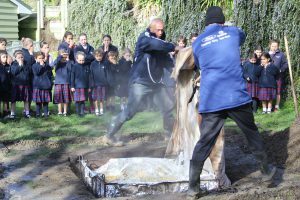 St Anthony’s School – a commitment to tikanga, te teo and mātauranga Māori. For a number of years now St Anthony’s School in Seatoun, Wellington, have committed to providing all students with multiple and varied learning opportunities to allow them to develop a knowledge, respect and love of tikanga, te teo and mātauranga Māori. The quote from our archdiocesan Synod ‘Go you are sent…’ challenges us to deepen our bicultural relationship and we are committed to doing this in as many ways possible. Each new term we welcome our new students and families to St Anthony’s with a pōwhiri and Mass. We combine both as we see this as an outward sign of the importance of our bicultural and spiritual foundations we are welcoming these families into. The regular kapa haka learning has strengthened our skill at performing the pōwhiri correctly. The ability for students to use karanga and waiata as a real part of their school life is an amazing learning opportunity for everyone. Tuakana-teina is an initiative we have been developing over the last 18 months to enable students to develop their understanding of peer ministry and build the relationships between the older and younger students. We celebrate te reo Māori Language Week each year. The students are immersed in and exposed to a wide range of activities, games, song and language. The week’s highlight is helping to prepare and put down a hāngi, culminating in us coming together and sharing a traditional feast. The hāngi is a hands-on learning experience for the children as well as a community event. To further deepen our acknowledgement and the value we place on biculturalism, the Board of Trustees are working with Deacon Danny Karatea-Goddard at the Archdiocese of Wellington to explore with our community how to continue to grow and manifest our commitment to bicultural unity. The visible signs of our unity include replicating our school name in te reo Māori, and giving our buildings Māori references. We proudly display a Māori flag on our flagpole so the students have a constant reminder we are a bicultural nation. The words of Ephesians 4:13 (above) are a wonderful reflection. By deepening our knowledge of biculturalism we are successfully building unity within our school and local communities.